Shane Shirley : It's as Easy as 1, 2, 3 to WIN One of The Best Reusable Bottles I Have Ever Found! How You Can Win the Environmental Booty Bamboo Bottle Facebook Giveaway! It's as Easy as 1, 2, 3 to WIN One of The Best Reusable Bottles I Have Ever Found! How You Can Win the Environmental Booty Bamboo Bottle Facebook Giveaway! This Giveaway is now closed. Please check out the Fan Giveaway tab above for our current giveaway!! I am lucky enough to get the hottest eco-friendly products sent right to my door and from now on, each month, I am going to give you a chance to get some too on our Environmental Booty Facebook Fan Page!! This month, the folks at the Bamboo Bottle Company have partnered with us and are offering you the chance to win one of the best reusable bottles I have ever found. And winning is as easy as 1, 2, 3! Become a Fan for Your First Entry! - Like Environmental Booty on Facebook! If you are already a fan of Environmental Booty on Facebook, you are entered to win already. Leave a Comment on Our Facebook Wall if You Would Like to Earn Another Entry! - We would love for you to say "Hello!" or tell us what's green in your life. Got a great green blog post? We would love to read it. Have a question? We'll help you find the answer. Each comment, earns you an entry. Share - Share on Facebook earn an entry! Share on Twitter with the button above and earn an entry! Share on Google+ with the button above or below to get another entry! 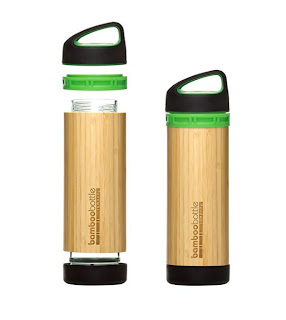 This Bamboo Bottle is a big value for anyone at just $25 because it has staying power. This is not your everyday reusable bottle. In fact, I would say it is one of the best reusable bottles, ergonomically and health wise I have ever used. Although it is heavier than most reusable bottles, it is easy to carry ,the Bamboo Bottle won't dent if you drop it and it won't leach hormone disrupting chemicals into your drink like plastic bottles. This isn't the lightweight reusable bottle I would pick for a day backpacking or biking, this is the bottle I can use every single day. Using the practically inexhaustible resources of bamboo and glass, this great looking, long lasting and ergonomically designed bottle will help you to help yourself stay stylish, hydrated and healthy, while helping the planet. Even not so green, Big Bad Dad wants one. His exact words as I pulled it from the box were, "Wow, that's cool! Can I have it?" Meet our green partner, Bamboo Bottle Company above and check out the Bamboo Bottle up close and personal! Then leave a comment below (including your email) telling us what you think the best design feature of the Bamboo Bottle is! Download Now for 5 More Entries!! Visit Now for 5 MORE Entries!! Official Rules: Giveaway Begins: July 1, 2011 (12:01am EST) and Giveaway Ends: July 31, 2011 (midnight EST), 2011. All entries (not comments) are assigned a number and I use a random number generator to choose the winner. Once again, good luck and have fun spreading the green message of responsible, collective consumerism! !